I am not a big fan of using arguments such as “food questionnaires are unreliable” and “observational studies are worthless” to completely dismiss a study. There are many reasons for this. One of them is that, when people misreport certain diet and lifestyle patterns, but do that consistently (i.e., everybody underreports food intake), the biasing effect on coefficients of association is minor. Measurement errors may remain for this or other reasons, but regression methods (linear and nonlinear) assume the existence of such errors, and are designed to yield robust coefficients in their presence. Besides, for me to use these types of arguments would be hypocritical, since I myself have done several analyses on the China Study data (), and built what I think are valid arguments based on those analyses. My approach is: Let us look at the data, any data, carefully, using appropriate analysis tools, and see what it tells us; maybe we will find evidence of measurement errors distorting the results and leading to mistaken conclusions, or maybe not. 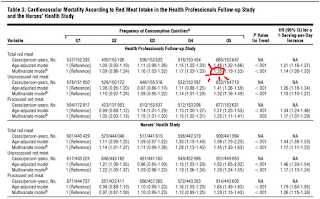 With this in mind, let us take a look at the top part of Table 3 of the most recent (published online in March 2012) study looking at the relationship between red meat consumption and mortality, authored by Pan et al. (Frank B. Hu is the senior author) and published in the prestigious Archives of Internal Medicine (). This is a prominent journal, with an average of over 270 citations per article according to Google Scholar. The study has received much media attention recently. Take a look at the area highlighted in red, focusing on data from the Health Professionals sample. That is the multivariate-adjusted cardiovascular mortality rate, listed as a normalized percentage, in the highest quintile (Q5) of red meat consumption from the Health Professionals sample. The non-adjusted percentages are 1.4 percent mortality in Q5 and 1.13 in Q1 (from Table 1 of the same article); so the multivariate adjustment-normalization changed the values of the percentages somewhat, but not much. 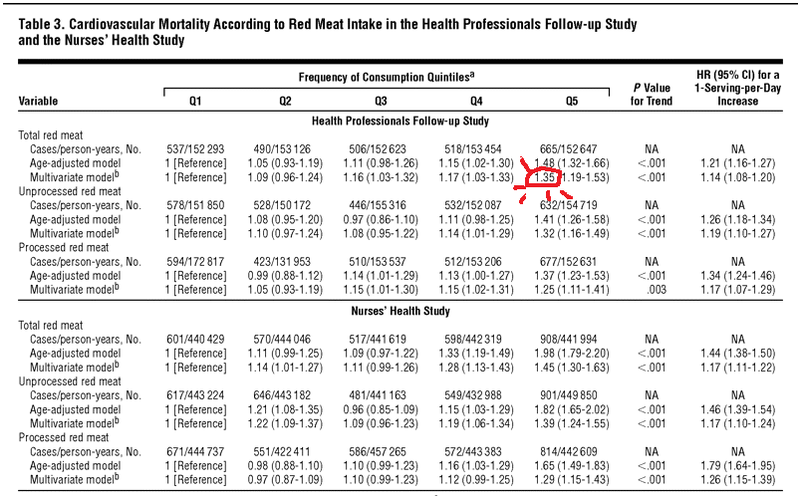 The highlighted 1.35 number suggests that for each group of 100 people who consumed a lot of red meat (Q5), when compared with a group of 100 people who consumed little red meat (Q1), there were on average 0.35 more deaths over the same period of time (more than 20 years). The heavy red meat eaters in Q5 consumed 972.37 percent more red meat than those in Q1. This is calculated with data from Table 1 of the same article, as: (2.36-0.22)/0.22. In Q5, the 2.36 number refers to the number of servings of red meat per day, with each serving being approximately 84 g. So the heavy red meat eaters ate approximately 198 g per day (a bit less than 0.5 lb), while the light red meat eaters ate about 18 g per day. In other words, the heavy red meat eaters ate 9.7237 times more, or 972.37 percent more, red meat. So, just to be clear, even though the folks in Q5 consumed 972.37 percent more red meat than the folks in Q1, in each matched group of 100 you would not find a single additional death over the same time period. If you looked at matched groups of 1,000 individuals, you would find 3 more deaths among the heavy red meat eaters. The same general pattern, of a minute difference, repeats itself throughout Table 3. As you can see, all of the reported mortality ratios are 1-point-something. In fact, this same pattern repeats itself in all mortality tables (all-cause, cardiovascular, cancer). This is all based on a multivariate analysis that according to the authors controlled for a large number of variables, including baseline history of diabetes. 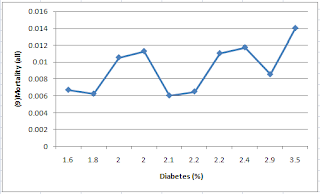 Interestingly, looking at data from the same sample (Health Professionals), the incidence of diabetes is 75 percent higher in Q5 than in Q1. The same is true for the second sample (Nurses Health), where the Q5-Q1 difference in incidence of diabetes is even greater - 81 percent. This caught my eye, being diabetes such a prototypical “disease of affluence”. So I entered the whole data reported in the article into HCE () and WarpPLS (), and conducted some analyses. 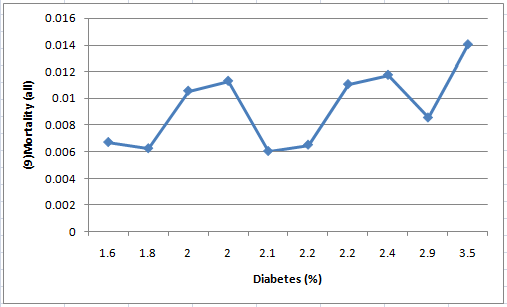 The graphs below are from HCE. The data includes both samples – Health Professionals and Nurses Health. HCE calculates bivariate correlations, and so does WarpPLS. But WarpPLS stores numbers with a higher level of precision, so I used WarpPLS for calculating coefficients of association, including correlations. I also double-checked the numbers with other software, just in case (e.g., SPSS and MATLAB). 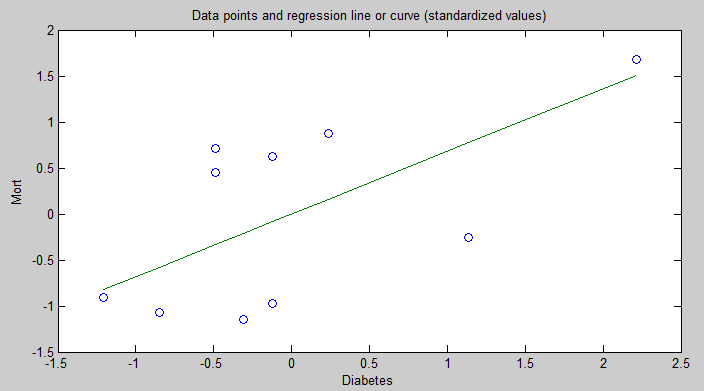 Here are the correlations calculated by WarpPLS, which refer to the graphs above: 0.030 for red meat intake and mortality; 0.607 for diabetes and mortality; and 0.910 for food intake and diabetes. Yes, you read it right, the correlation between red meat intake and mortality is a very low and non-significant 0.030 in this dataset. Not a big surprise when you look at the related HCE graph, with the line going up and down almost at random. Note that I included the quintiles data from both the Health Professionals and Nurses Health samples in one dataset. Those folks in Q5 had a much higher incidence of diabetes, and yet the increase in mortality for them was significantly lower, in percentage terms. A key difference between Q5 and Q1 being what? The Q5 folks ate a lot more red meat. This looks suspiciously suggestive of a finding that I came across before, based on an analysis of the China Study II data (). The finding was that animal food consumption (and red meat is an animal food) was protective, actually reducing the negative effect of wheat flour consumption on mortality. That analysis actually suggested that wheat flour consumption may not be so bad if you eat 221 g or more of animal food daily. 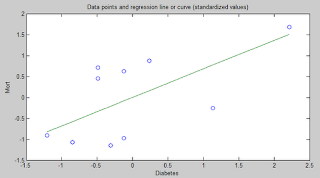 So, I built the model below in WarpPLS, where red meat intake (RedMeat) is hypothesized to moderate the relationship between diabetes incidence (Diabetes) and mortality (Mort). Below I am also including the graphs for the direct and moderating effects; the data is standardized, which reduces estimation error, particularly in moderating effects estimation. I used a standard linear algorithm for the calculation of the path coefficients (betas next to the arrows) and jackknifing for the calculation of the P values (confidence = 1 – P value). Jackknifing is a resampling technique that does not require multivariate normality and that tends to work well with small samples; as is the case with nonparametric techniques in general. The direct effect of diabetes on mortality is positive (0.68) and almost statistically significant at the P < 0.05 level (confidence of 94 percent), which is noteworthy because the sample size here is so small – only 10 data points, 5 quintiles from the Health Professionals sample and 5 from the Nurses Health sample. The moderating effect is negative (-0.11), but not statistically significant (confidence of 61 percent). 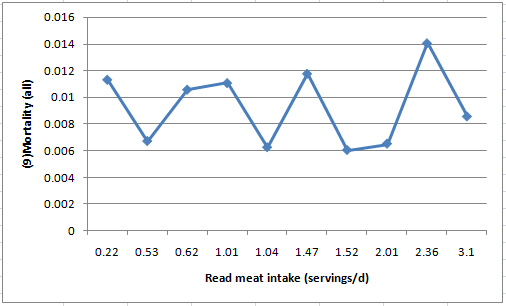 In the moderating effect graphs (shown side-by-side), this negative moderation is indicated by a slightly less steep inclination of the regression line for the graph on the right, which refers to high red meat intake. A less steep inclination means a less strong relationship between diabetes and mortality – among the folks who ate the most red meat. 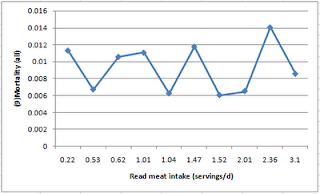 Not too surprisingly, at least to me, the results above suggest that red meat per se may well be protective. Although we should consider a least two other possibilities. One is that red meat intake is a marker for consumption of some other things, possibly present in animal foods, that are protective - e.g., choline and vitamin K2. The other possibility is that red meat is protective in part by displacing other less healthy foods. Perhaps what we are seeing here is a combination of these. Whatever the reason may be, red meat consumption seems to actually lessen the effect of diabetes on mortality in this sample. That is, according to this data, the more red meat is consumed, the fewer people die from diabetes. The protective effect might have been stronger if the participants had eaten more red meat, or more animal foods containing the protective factors; recall that the threshold for protection in the China Study II data was consumption of 221 g or more of animal food daily (). 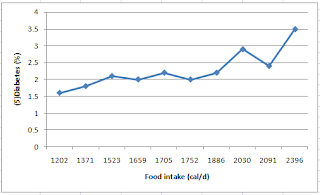 Having said that, it is also important to note that, if you eat excess calories to the point of becoming obese, from red meat or any other sources, your risk of developing diabetes will go up – as the earlier HCE graph relating food intake and diabetes implies. Please keep in mind that this post is the result of a quick analysis of secondary data reported in a journal article, and its conclusions may be wrong, even though I did my best not to make any mistake (e.g., mistyping data from the article). The authors likely spent months, if not more, in their study; and have the support of one of the premier research universities in the world. Still, this post raises serious questions. I say this respectfully, as the authors did seem to try their best to control for all possible confounders. I should also say that the moderating effect I uncovered is admittedly a fairly weak effect on this small sample and not statistically significant. But its magnitude is apparently greater than the reported effects of red meat on mortality, which are not only minute but may well be statistical artifacts. The Cox proportional hazards analysis employed in the study, which is commonly used in epidemiology, is nothing more than a sophisticated ANCOVA; it is a semi-parametric version of a special case of the broader analysis method automated by WarpPLS. Finally, I could not control for confounders because, given the small sample, inclusion of confounders (e.g., smoking) leads to massive collinearity. WarpPLS calculates collinearity estimates automatically, and is particularly thorough at doing that (calculating them at multiple levels), so there is no way to ignore them. Collinearity can severely distort results, as pointed out in a YouTube video on WarpPLS (). Collinearity can even lead to changes in the signs of coefficients of association, in the context of multivariate analyses - e.g., a positive association appears to be negative. The authors have the original data – a much, much larger sample - which makes it much easier to deal with collinearity. Moderating effects analyses () – we need more of that in epidemiological research eh? In the two last posts I discussed the idea of gaining muscle and losing fat at the same time () (). This post outlines one approach to make that happen, based on my own experience and that of several HCE () users. This approach may well be the most natural from an evolutionary perspective. But first let us address one important question: Why would anyone want to reach a certain body weight and keep it constant, resorting to the more difficult and slow strategy of “turning fat into muscle”, so to speak? One could simply keep on losing fat, without losing or gaining muscle, until he or she reaches a very low body fat percentage (e.g., a single-digit body fat percentage, for men). Then he or she could go up from there, slowly putting on muscle. The reason why it is advisable to reach a certain body weight and keep it constant is that, below a certain weight, one is likely to run into nutrient deficiencies. Non-exercise energy expenditure is proportional to body weight. As you keep on losing body weight, calorie intake may become too low to allow you to have a nutrient intake that is the minimum for your body structure. Unfortunately eating highly nutritious vegetables or consuming copious amounts of vitamin and mineral supplements will not work very well, because the nutritional needs of your body include both micro- and macro-nutrients that need co-factors to be properly absorbed and/or metabolized. One example is dietary fat, which is necessary for the absorption of fat-soluble vitamins. If you place yourself into a state of nutrient deficiency, your body will compensate by mounting a multipronged defense, resorting to psychological and physiological mechanisms. Your body will do that because it is hardwired for self-preservation; as noted below, being in a state of nutrient deficiency for too long is very dangerous for one's health. Most people cannot oppose this body reaction by willpower alone. That is where binge-eating often starts. This is one of the key reasons why looking for a common denominator of most diets leads to the conclusion that all succeed at first, and eventually fail (). If you are one of the few who can oppose the body’s reaction, and maintain a very low calorie intake even in the face of nutrient deficiencies, chances are you will become much more vulnerable to diseases caused by pathogens. Individually you will be placing yourself in a state that is similar to that of populations that have faced famine in the past. Historically speaking, famines are associated with decreases in degenerative diseases, and increases in diseases caused by pathogens. Pandemics, like the Black Death (), have historically been preceded by periods of food scarcity. The approach to gaining muscle and losing fat at the same time, outlined here, relies mainly on the following elements: (a) regularly conducting strength training; (b) varying calorie intake based on exercise; and (c) eating protein regularly. To that, I would add becoming more active, which does not necessarily mean exercising but does mean doing things that involve physical motion of some kind (e.g., walking, climbing stairs, moving things around), to the tune of 1 hour or more every day. These increase calorie expenditure, enabling a slightly higher calorie intake while maintaining the same weight, and thus more nutrients on a diet of unprocessed foods. In fact, even things like fidgeting count (). These activities should not cause muscle damage to the point of preventing recovery from strength training. As far as strength training goes, the main idea, as discussed in the previous post, is to regularly hit the supercompensation window, with progressive overload, and maintain your current body weight. In fact, over time, as muscle gain progresses, you will probably want to increase your calorie intake to increase your body weight, but very slowly to keep any fat gain from happening. This way your body fat percentage will go down, even as your weight goes up slowly. The first element, regularly hitting the supercompensation window, was discussed in a previous post (). Varying calorie intake based on exercise. Here one approach that seems to work well is to eat more in the hours after a strength training session, and less in the hours preceding the next strength training session, keeping the calorie intake at maintenance over a week. Individual customization here is very important. Many people will respond quite well to a calorie surplus window of 8 – 24 h after exercise, and a calorie deficit in the following 40 – 24 h. This assumes that strength training sessions take place every other day. The weekend break in routine is a good one, as well as other random variations (e.g., random fasts), as the body tends to adapt to anything over time (). One example would be someone following a two-day cycle where on the first day he or she would do strength training, and eat the following to satisfaction: muscle meats, fatty seafood (e.g., salmon), cheese, eggs, fruits, and starchy tubers (e.g., sweet potato). 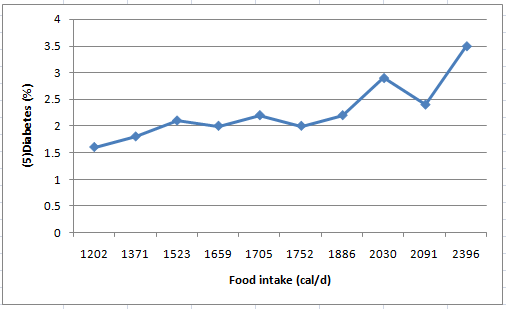 On the second day, a rest day, the person would eat the following, to near satisfaction, limiting portions a bit to offset the calorie surplus of the previous day: organ meats (e.g., heart and liver), lean seafood (e.g., shrimp and mussels), and non-starchy nutritious vegetables (e.g., spinach and cabbage). This would lead to periodic glycogen depletion, and also to unsettling water-weight variations; these can softened a bit, if they are bothering, by adding a small amount of fruit and/or starchy foods on rest days. Organ meats, lean seafood, and non-starchy nutritious vegetables are all low-calorie foods. So restricting calories with them is relatively easy, without the need to reduce the volume of food eaten that much. If maintenance is achieved at around 2,000 calories per day, a possible calorie intake pattern would be 3,000 calories on one day, mostly after strength training, and 1,000 calories the next. This of course would depend on a number of factors including body size and nonexercise thermogenesis. A few calories could be added or removed here and there to make up for a different calorie intake during the weekend. Some people believe that, if you vary your calorie intake in this way, the calorie deficit period will lead to muscle loss. This is the rationale behind the multiple balanced meals a day approach; which also works, and is successfully used by many bodybuilders, such as Doug Miller () and Scooby (). 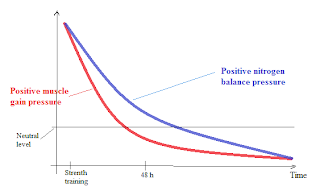 However, it seems that the positive nitrogen balance stimulus caused by strength training leads to a variation in nitrogen balance that is nonlinear and also different from the stimulus to muscle gain. 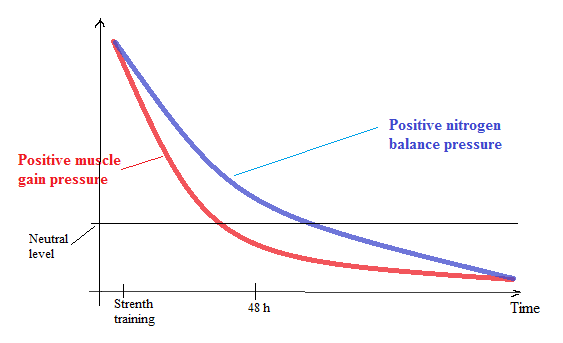 Being in positive or neutral nitrogen balance is not the same as gaining muscle mass, although the two should be very highly correlated. While the muscle gain window may close relatively quickly after the strength training session, the window in which nitrogen balance is positive or neutral may remain open for much longer, even in the face of a calorie deficit during part of it. This difference in nonlinear response is illustrated through the schematic graph below. Eating protein regularly. Here what seems to be the most advisable approach is to eat protein throughout, in amounts that make you feel good. (Yes, you should rely on sense of well being as a measure as well.) There is no need for overconsumption of protein, as one does not need much to be in nitrogen balance when doing strength training. For someone weighing 200 lbs (91 kg) about 109 g/d of high-quality protein would be an overestimation () because strength training itself pushes one’s nitrogen balance into positive territory (). The amount of carbohydrate needed depends on the amount of glycogen depleted through exercise and the amount of protein consumed. The two chief sources for glycogen replenishment, in muscle and liver, are protein and carbohydrate – with the latter being much more efficient if you are not insulin resistant. How much dietary protein can you store in muscle? About 15 g/d if you are a gifted bodybuilder (). Still, consumption of protein stimulates muscle growth through complex processes. And protein does not usually become fat if one is in calorie deficit, particularly if consumption of carbohydrates is limited (). The above is probably much easier to understand than to implement in practice, because it requires a lot of customization. It seems natural because our Paleolithic ancestors probably consumed more calories after hunting-gathering activities (i.e., exercise), and fewer calories before those activities. Our body seems to respond quite well to alternate day calorie restriction (). Moreover, the break in routine every other day, and the delayed but certain satisfaction provided by the higher calorie intake on exercise days, can serve as powerful motivators. The temptation to set rigid rules, or a generic formula, always exists. But each person is unique (). For some people, adopting various windows of fasting (usually in the 8 – 24 h range) seems to be a very good strategy to achieve calorie deficits while maintaining a positive or neutral nitrogen balance. For others, fasting has the opposite effect, perhaps due to an abnormal increase in cortisol levels. This is particularly true for fasting windows of 12 – 24 h or more. If regularly fasting within this range stresses you out, as opposed to “liberating” you (), you may be in the category that does better with more frequently meals.